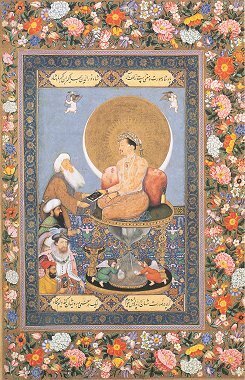 Shahjahan Enthroned with Mahabat Khan and a Shaykh (Mughal, 1629). 400 Darfur refugees dying every day. WSJ reporter: "Being a foreign correspondent in Baghdad these days is like being undervirtual house arrest." Poll: Americans Uninformed on Bush, Kerry. IMF Approves $436 Million Loan for Iraq. Why Iraq, you may ask? "Pentagon wants 'uplifting accounts' about Iraq: Administration wants upbeat reports, will 'curtail' bad news about Iraq." "More than 90 percent of Palestinians support calls for sweeping reforms of Yasser Arafat's Palestinian Authority but far fewer think they will happen, a poll published on Thursday said." The books that Texas banned. I noticed that both Kerry and Bush invoked the security of Israel as an important factor in their respective foreign policies. Well, one thing is for sure. THIS IS ZIONISM: "Israeli forces killed at least 23 Palestinians yesterday on one of the bloodiest days of the intifada, as the army made a rare push into the heart of a heavily defended Gaza refugee camp. A single tank shell claimed seven lives, many of them said by witnesses to be unarmed teenagers. But doctors said it was difficult to tell because the bodies were blown apart." Why Have We Suddenly Forgotten Abu Ghraib? When everything else fails, try empty propaganda and lies: "The Bush administration, battling negative perceptions of the Iraq war, is sending Iraqi Americans to deliver what the Pentagon calls "good news" about Iraq to U.S. military bases, and has curtailed distribution of reports showing increasing violence in that country." Full text. A new report finds the Defense Department now spends half of its entire budget on private contractors. The study also found that the top 50 contractors received more than half of all the money and were more likely to get contracts without competitive bidding. Do Bush and `Allawi have the same speech writers? Judge for yourselves. While Bush continues to "make progress" in Iraq, September was among Deadliest Months for U.S. in Iraq. 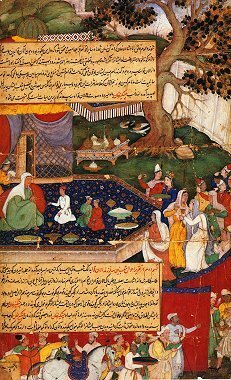 Alanquva and Her Three Sons (from the Chingiznama of Rashid ad-Din, India, 1596). Putin hurts democracy, petition says. 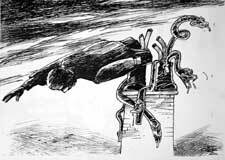 Iraqi political cartoon published in Baghdad. Growing Pessimism on Iraq: Doubts Increase Within U.S. Security Agencies. Men in Government Uniforms Backed by Aircraft Force Residents From Homes. This the kind of oppression that America loves: "Jordan Acts to Curb a Rising Chorus of Critics." In the Bedroom (With Stalin) (review article by Ronald Suny). "Continued U.S. Airstrikes in Baghdad Draw Criticism: Sadr City neighborhood is attacked for a second day. Interim [puppet] president of Iraq likens the tactics to Israeli military actions in the Gaza Strip." This is Zionism: "Paramilitary border police detained two Palestinians at a checkpoint and beat them, forced one to drink urine and burned both with cigarettes." Addiction behind the burka: how Afghan women use drugs to cope with legacy of war. "America's moms look for the toughest guy on TV tough guy." Japanese women curl up with the perfect man: "A pillow-shaped man without a head and stuffed full of foam is the latest sleeping aid from Japan." Iraqis, freshly "liberated" by US forces in Baghdad. Iraq insurgency outpaces coalition attempts to restore peace. "Al-Azhar is wrong, but the state is the real culprit." Iraqi puppet prime minister/car bomber/former Saddam's assassin/embezzler-in-Yemen, Iyad `Allawi said that the insurgency is confined to two pockets in two localities in Iraq, but : "Over the past 30 days, more than 2,300 attacks by insurgents have been directed against civilians and military targets in Iraq, in a pattern that sprawls over nearly every major population center outside the Kurdish north, according to comprehensive data compiled by a private security company with access to military intelligence reports and its own network of Iraqi informants." In an interview with Fox News, George W. Bush said that he always "prays for wisdom." This constitutes the strongest evidence that there is indeed no God. The fanatical clerics of the House of Saud have ruled: The General Mufti of Saudi Arabia, `Abdul-`Aziz Bin `Abdullah Al Ash-Shaykh (a descendant of Muhammad Ibn `Abdul-Wahab, the founder of Wahhabiyya "doctrine") has "prohibited the sale and use of cellphones equipped with cameras knowing that most of their use will be to capture images of the prohibited." He added in an interview with Al-Madinah newspaper that such cellphones could be used to "capture and spread fahishah (sexual misdeeds) in Muslim society. The Saudi State (Ministry of Interior and Ministry of Commerce) has banned the import and sale of such phones in the kingdom. 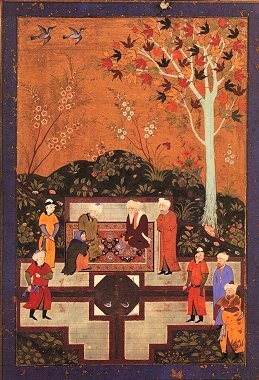 An Old Woman and Two Sages in a Garden (Bukhara, 1520). Network Hasn't Undergone Realistic Testing. CIA Pessimistic About Iraq: Situation Worse Than Portrayed, Analysts Say. Two U.S. soldiers have been charged with murder in the death of an Iraqi civilian. The myth of the foreign fighters in Iraq: Insurgents Are Mostly Iraqis, U.S. Military Says. This is the progress that Bush is making in Iraq: "U.S. troops have tried to win over residents in Ramadi, but a surge in abductions and killings is threatening to create another Fallouja." 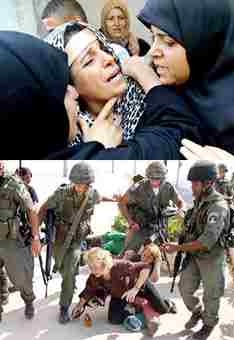 Another day in the life of Palestinians. Official says US policy to blame for war threat. An Iraqi woman carrying her injured child in Sadr City after a round of US bombing. Afghan election will be held in fear, says report. US elections will be held in fear, says Angry Arab. This is Zionism. 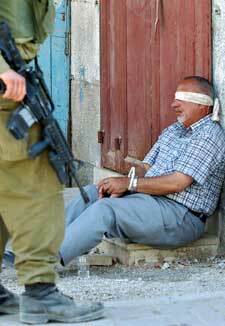 Settler put under house arrest over killing Palestinian. (The Israeli state will also provide him with free daily pizzas as a reward for his crime). Women protesters held in Zimbabwe. Tribunals are 'US insult to Britain'. Forgotten Bangladesh suffers the rains in silence: A million children face acute illness or death within weeks. FBI swamped by terror tapes: Struggling bureau has more than 120,000 hours of wire-tapped conversations awaiting analysis. Bush ignored warnings on Iraq insurgency threat before invasion. For those who care, I can be heard live tomorrow at 7:00AM (Pacific Time) on KPFA's Morning Show. (There will come a time when no media in the world will have me on except KPFA. Mark my words). Lebanese government is now being blamed for the death of a prisoner in its custody. I would not be surprised if the Lebanese and Syrian governments (both of which have committed torture in the past and the present--the Syrian Ba`thist record is notorious in this respect) tortured the prisoner to death. It will not be the first time. Perhaps they were too eager to manufacture an Al-Qa`idah plot to please the American government. And the Minister of Interior in Lebanon is the king of uncovering plots--mostly wild and imaginary, having uncovered a "diabolical" plot by Satan Worshippers last year. He appeared on LBC TV last year and talked about the plot, and said that he had documents showing that the Lebanese Satan worshippers also engaged in "sexual deviance." His father (a silly puppet of the Syrian government) got him the job of Minister of Interior; his father Michel Al-Murr paid Lebanese deputies to "elect" Israeli criminal puppet Bashir Gemayyel in 1982, and then switched his allegiance to Syrian government in the mid-1980s. Former prime minister of Lebanon Salim Huss who tried to exclude corrupt Al-Murr from his cabinet in 1998 told me that Syrian government insisted on including him. Do not be surprised if the Lebanese government now uncovers Al-Qa`idah plots on a daily basis, and that would lead to American support for the Lebanese (and Syrian) government. I have been watching Al-Arabiyya TV news channel, having recently added it to my vast collection of channels. What a Saudi propaganda outlet, although it projects an unrepresentative agenda and message of the true essence of the Saudi government. They make an effort to not show the religious-fanatical agenda of the House of Saud. But they manage subtle or not so subtle things that show the truly colors. Yesterday, they ran several times a day a documentary on the former Cat Stevens (who is a religious fanatic and who supported Khumayni's fatwa against Salman Rushdi). 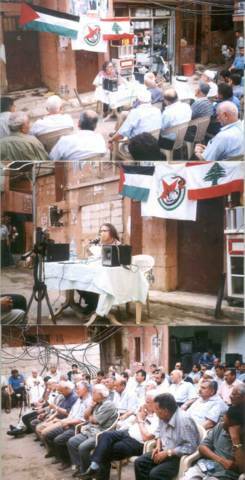 And to project a non-religious message, AlArabiyya brought Lebanese journalists with background in Lebanese right-wing Christian militias: like Elie Naquzi (who almost works unofficially as a media advisor for Iyad `Allawi and travels with him) and the highly obnoxious Jizel Khuri. Both of them (typical of these right-wing Lebanese militia supporters types in Lebanon) have a lousy command of the Arabic language and cannot manage a full sentence in Fusha (classical Arabic). So they speak in that highly annoying colloquial Lebanese dialect of East Beirut, made popular by Israeli-supported criminal Bashir Gemayyel. Add a new title to Iyad `Allawi. A blatant and lousy liar. 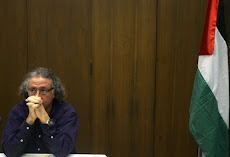 He sat for an hour interview yesterday with...Elie Naquzi, who is preparing a documentary on...`Allawi for AlArabiyya. (I was interviewed for a documentary on US elections for AlArabiyya and am certain that my interview will not run.) The interview was incredible: like the King of Jordan, `Allawi says one thing in Arabic, and another in English. Regarding his meeting with the Israeli fascistic foreign minister, he now says that he shook his hands without knowing who he was, and that because he was fairskinned, he assumed that he was European. He also claimed in Arabic that his visit to US increased the poll standing of George W. Bush. In English, `Allawi claims (especially in New York Times and Washington Post) that he has bravely met with insurgents and resistance leaders in Iraq. The New York Times and other newspapers reported that as a sign of his tough and gutsy persona. In Arabic interviews, you learn that he did not actually meet with any resistance or insurgent leaders. He talked about meeting with tribal leaders from Fallujah, who have even met with US military officers. But these are details that may disturb the pro-war agenda of John Burns of the New York Times, or the editorial policy of the Washington Post. House of Saudi is really scared of the US government, and of Kerry in particular. I assure them that every American administration will protect the corrupt and obscurantist House of Saud. To appease the US, all Saudi-run media in the Arabic world are now singing the same American tune. Whenever AlArabiyya reports about US bombings of site in As-Sadr city, they precede it by saying that As-Sadr's forces bomb US military bases non-stop. But the accounts of Iraqis on the ground tell a different story, even on the screen of AlArabiyya. AlArabiyya is now run by `Abdur-Rahman Ar-Rashid, who used to run the conservative Ash-Sharq Al-Awsat daily. Ash-Sharq Al-Awsat is run by a media conglomerate run by Prince Salman bin `Abdul-`Aziz, who is aspires to be king, as one former US ambassador in Saudi Arabia told me. But there is a big paradox in Saudi media (AlArabiyya, Ash-Sharq Al-Awsat, Al-Hayat, and Elaph.com among others): the now claim to promote an enlightened and liberal position, but they yet support the...HOUSE OF SAUD and Wahhabi fanaticism. Resolve that contradiction for me, would you. I watched some of Bush's interview on Fox News. I really now get it. I have always wondered why he--whenever is asked on Iraq--cannot manage to say anything intelligent except: "freedom, liberty, potato, democracy," on and on and on. It struck me that he has the most simple mind I have ever seen on a human being. He really is incapable of more than that. It is beyond his capacity. Yet, he will win, and probably with a wide margin: he effectively scared the US public making it sound that he is running against John Bin Ladin, and John Kerry is the worst candidate possible. With a second Bush administration, I am bracing myself for a world that is destined to be less safe, less free, and less secure. 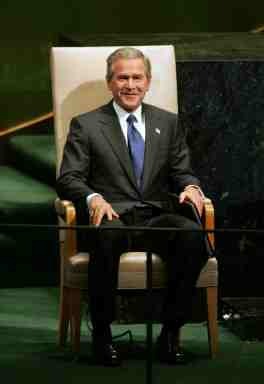 That George W. Bush is resolute and firm pleases the American people, but worries me a great deal. I do not want somebody who is intellectually lazy and lacks basic knowledge of world affairs and geography (although he noted twice last year that US is surrounded by oceans--that is a step in the right direction of knowledge) to be firm and stubborn. But that is me. 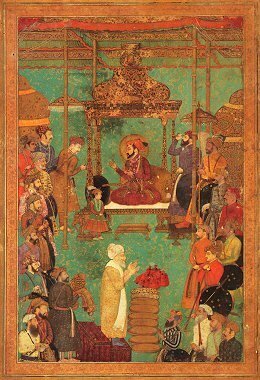 Emperor Shah Jahan presents a book to Shaykh Husayn, descendant of Muiniddin Chishti and superintendent of the shrine at Ajmer (Indian, 17th century). "The Bush administration has failed to realize the hopes and dreams of women and girls in much of post-Taliban Afghanistan according to several human and women's rights groups who warned Wednesday that the time to redress the situation is fast running out." I am confused. Is Bush not a feminist? Is CIA at war with Bush? Her house was destroyed by Israeli forces in Khan Yunis. According to PCHR’s documentation, Israeli occupying forces and settlers have killed 2233 Palestinians Civilians in the Occupied Palestinian Territories. 1285 (57%) were killed in the West Bank (including 40 in occupied East Jerusalem). 948(43%) were killed in the Gaza strip. 493 (20%) were children under age 17. 355(14%) were killed in assassination operations, including at least 137 (39% of the total number of killed in assassinations) bystanders, of whom 40(11%) were children. 246 (10.8%) were on-duty members of PNA security services. 18 were on-duty medical workers, including doctors and paramedics. 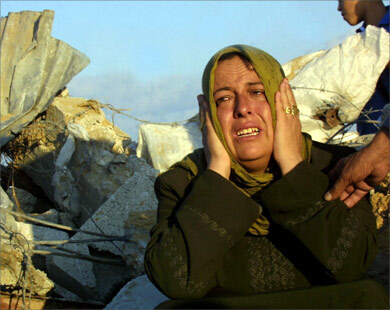 42 were killed by Israeli settlers residing in the OPT in violation of international humanitarian law. 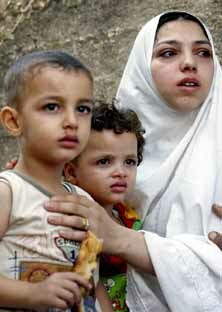 7085 Palestinians have been injured since the outbreak of the intifada in the Gaza strip. 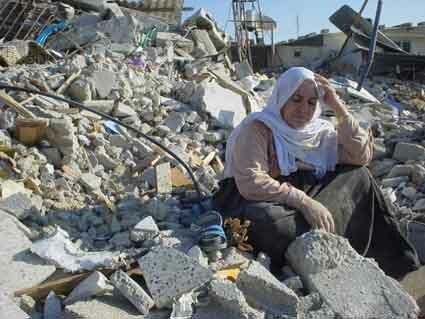 Israeli Occupying Troops attack Khan Yunis and destroy 54 houses, kill one Palestinian Civilian and Injure 5 Others. Zarqawi Emerges as Al Qaeda Rival, Ally. Blood of the Homeless Darkens the Streets of Brazil's Largest City. Afghans Are Fed Up With Security Firm. "Despite continuing violence and instability, President Bush has stuck doggedly to his central message on Iraq: There is no need to change course because the administration's plan for planting democracy in the Middle East is working. Yet behind the unwavering public posture, there is evidence that the Bush administration has altered its approach. It has lowered its hopes for the type of democracy that can be achieved, changed course on its plans to privatize Iraq's economy and reordered its priorities by devoting more money to improving security as fast as possible." Was Afghanistan not "liberated" by Bush? Warlords 'call shots in Afghan election'. 'The Israelis got the wrong man - he was just the bodyguard'. Rage finds an outlet in Sudan's rebel camps. "It is reasonable to believe that there is certain cooperation between Israel and some Arab intelligence bodies, above all Jordan, which is not a secret, Egypt to a very limited degree, Morocco and Tunisia to a small extent, and the United Arab Emirates," Melman says." Knee-Deep by Slavoj Zizek. (thanks Karl). 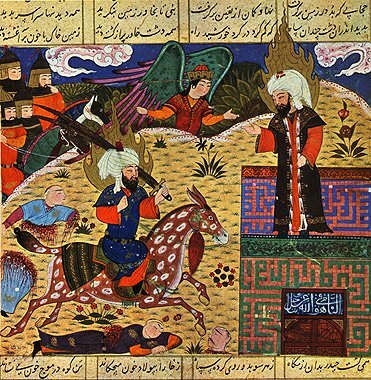 Gabriel shows the prowess of 'Ali to Muhammad (Shiraz, 1480). `Ali is seen holding his legendary sowrd named Dhu-l-Fiqar with the two blades. 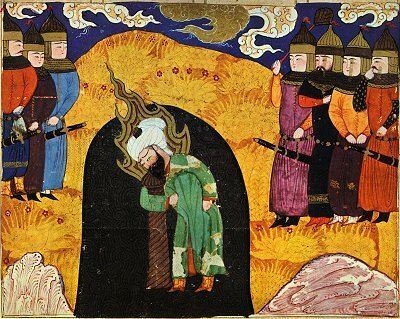 (Images of Muhammad are largely banned in Muslim countries, but such images appear in some non-Arab Muslim countries). UK accused of using aid to promote privatisation. Pentagon link to Guinea coup plot. 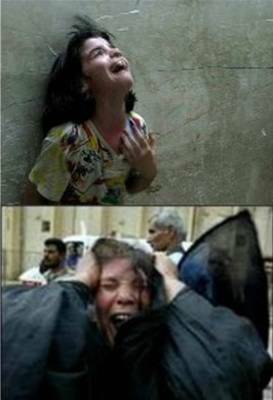 100 Children Die Daily in Iraq. IRAQ BODY COUNT: Killings Surge in Iraq, and Doctors See a Procession of Misery. While Bush is fighting his war on "terrorism," Al Qaeda Seen as Wider Threat: "The network has evolved into a looser, ideological movement that may no longer report to Bin Laden." Mossad agents jailed in New Zealand to be freed. They will serve as foreign policy advisors for the Bush and Kerry camaigns. Spy imagery agency takes new role inside United States after Sept. 11. I do not mean to bother you, but..."Afghans want real election." 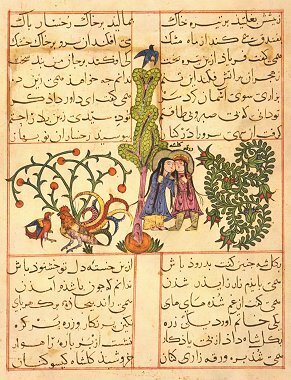 Ali removes a Pillar placed by Solomon in a Cave and releases a supply of good water (Shiraz, 1480). Children 'among airstrike victims' in Iraq. 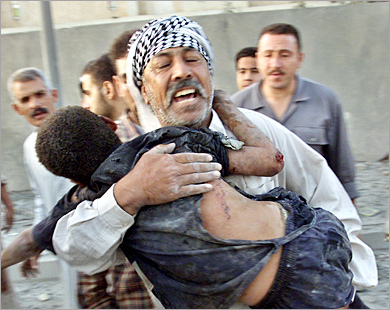 `Allawi thanks US: Iraqi civilian casualties mounting. More Iraqis killed by U.S. than by terror: Civilian deaths are undermining efforts to win over people. News from another sham "liberation": Many Voters Express Fear of Violence, Manipulation in 1st Presidential Race in Afghanistan. "Less than four months before planned national elections in Iraq, attacks against U.S. troops, Iraqi security forces and private contractors number in the dozens each day and have spread to parts of the country that had been relatively peaceful, according to statistics compiled by a private security firm working for the U.S. government." Iraqi puppet (in)justice: Chalabi Counterfeiting Charges Dropped. Much of the U.S. aid for rebuilding isn’t entering the economy, drained by the insurgency, profits for contractors and salaries for foreigners. "US efforts to win over the world's Muslims via news broadcasts, cultural exchanges, and other initiatives to explain American policies to skeptical audiences abroad are uncoordinated and underfunded, and risk sending contradictory messages about US intentions." (Their figures, however, on the "popularity" of AlHurra and Sawa are so inflated and not credible). Civilians die in US ground and air attack on bases in Fallujah. Zionism is also about theft: "Israel is continuing to expropriate territory in the West Bank, under the guise of "state lands" to expand settlements, data from the Civil Administration shows." "Palestinians who have scratched a living for generations in the desert defend their biblical way of life." The Janjaweed thugs are back: "After a murderous rampage which has left around 50,000 dead and a further 1.4 million homeless, there are growing fears that Sudan's government-sponsored Arab militias are involved in a covert operation to force displaced people back into the homes they have fled, to divert international attention from the crisis." An Iraqi terrorist child picked up from the rubble of a house dstroyed by US bombs in Fallujah. "Zarqawi has method in his madness." But the writer overstated his case here. I only see disgust and revulstion toward Zarqawi in the Arabic press. Amazing discovery by the US government: there is more than one Muslim by the name Yusuf. "The Cat Stevens incident has its origins in a spelling mistake." Profiles in Cowardice: "CBS News has shelved a "60 Minutes" report on the rationale for war in Iraq because it would be "inappropriate" to air it so close to the presidential election, the network said on Saturday." 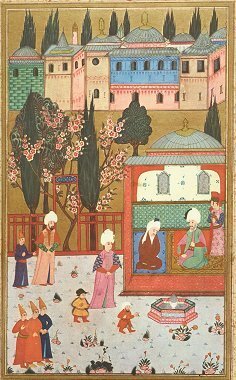 Lovers in a Garden (Turkish, 13th century). In my palms I have..."tears"
From kooky Taliban to kooky Taliban. Activists: Afghan women not better off. Israel's nukes serve to justify Iran's. Sailors Linked to Two Deaths in Iraq. Rebuilding Hindered by Past Mistakes. "Reluctant publishers, translation difficulties and tired preconceptions have all hampered the progress of Arabic literature in the west." How could the puppet prime minister/car bomber/embezzler-in-Yemen/former Saddam's assassin (Iyad `Allawi) lie? LATimes: Violence Belies Positive Picture: Few agree with Allawi's assessment as anxiety grips the nation amid a surge in attacks. "Israel is building its barrier on West Bank land not to keep out suicide bombers but to confiscate the land and put pressure on Palestinians to move away, a UN human rights investigator said on Friday." Bush plays on faith and family values to win over blue-collar Wisconsin. Britain is to pay off 10% of the money owed by the world's poorest countries to the World Bank and the African Development Bank in an attempt to free them from "the shackles of debt". The Guardian: How Bush's grandfather helped Hitler's rise to power. News about "liberated" Iraq: Top US officials clash over need to limit Iraq elections. The UK "government's crisis command unit, Cobra, is monitoring tension levels around Britain to guard against extremists using the plight of the British hostage Ken Bigley as an excuse to attack Muslims." An Israeli newspaper has reported that US/Israeli Hollywood mogul, Haim Saban, has offered to buy half of the shares of Al-Jazeera TV. This fanatical Zionist went with Bill Clinton to Qatar, and made the offer to the Amir of Qatar, according to the paper. AlJazeera has denied the report any sales of its share to Saban. As-Safir newspaper reported on the story. Full Text. Hidden Slaves: Forced Labor in the United States. L'écrivaine Françoise Sagan est morte. For those who care, I will appear live on Abu Dhabi TV's Panorama Program tomorrow Saturday at 11:00AM Pacific Time (18:00 GMT). The topic is US elections. 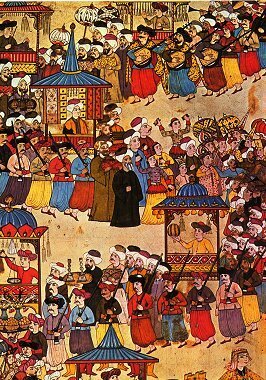 A celebrated mystic is received by the Sultan (Turkish, 16th century). For those who care, Angry Arab in Arabic...with English subtitles, "courtesy" of MEMRI TV service. (thanks Amir for alerting me to this file). MEMRI, as many of you know, was founded by "former" Israeli intelligence officials, and provides highly selective, and inaccurate and imprecise translations of Arabic and Persian media. They are fixated on either the kooky fundamentalist fanatics or the pro-American neo conservatives in the region. Most of the people of the region, of course, are neither. Angry Arab briefly pontificates in Eric Boehlert's article in Salon.com on US media coverage of the war. The Free World ... of Slums (By Slavoj Zizek). "Everything contained in the descriptive and normative term "globalization" is the effect not of economic inevitability but of a conscious and deliberate policy, if a policy more often than not not unaware of its consequences. That policy is quite paradoxical in that it is a policy of depolicitization. Drawing shamelesssly on the lexcicon of liberty, liberalism, and deregulation, it aims to grant economic determinisms a fatal stranglehold by liberating them from all controls, and to obtain the submission of citizens and governments to the economic and social forces thus "liberated." Incubated in the meetings of great international institutions such as the World Trade Organization and the Eruopean Commission, or within the "networks" of multinational corporations, this policy has imposed itself through the most varied means, specially juridical, on the liberal--or even social democratic--governments of a set of economically advanced countries, leading them gradually to divset themselves from the power to control economic forces." Pierre Bourdieu in Contre-feux 2: Pour un mouvement social european (published in US by The New Press as Firing Back: Against the Tyranny of the Market 2 from which this passage was cited). US military drops charges, as Gitmo espionage cases collapse. It is time for ALL to impose sanctions on Israel: "An influential Anglican group is to ask church leaders to impose a boycott of Israel and firms that do business there in protest at the occupation." Watching Israeli soldiers steal their land. Palestinians: One of their classmates died from her wounds caused by Israeli gunfire. Hepatitis spreads in 2 Iraqi districts: Collapse of water and sewage systems is believed to be at root of the illness. Empire is seeking "freedom of action": "The U.S. military is quietly expanding its network of small outposts worldwide to help fight terrorism in Middle Eastern and African hotspots, even as it prepares to send home tens of thousands of troops from Cold War bases in Germany and South Korea. Among the places the military already has placed or hopes to establish such new "lily pads" or jumping off points: Bulgaria and Romania in Eastern Europe; a pier in Singapore, Azerbaijan in Central Asia, and a tiny island off the oil-rich coast of West Africa. "Freedom of action," is a term the Pentagon uses to describe the flexibility it seeks, and Defense Secretary Donald H. Rumsfeld is to brief senators on the plan Thursday." Class and social inequalities: "People who make more than $75,000 a year are far more likely than those who make $25,000 or less to say are "very satisfied" with their lives -- 56 percent of the higher-income group compared with 24 percent of the lower-income group." That was quite a sight. Was it not? I mean the car bomber (`Allawi) in the US congress. Here was a former killer for Saddam pontificating about "freedom"--what else--to members of the US congress, in the self-designated "beacon of freedom." But I bet that this is not the first time that a murderer or killer or a car bomber addresses the audience of crooks, charletans, and demagogues. I was trying to guess the speech writers of `Allawi's words in US. I reached the following conclusions: `Allawi's speech in the Congress had the touch of Kanan Makiya (the neo-con guy who had told Bush that Iraqis would greet US occupation forces with "sweets and flowers"), especially that grotesque phrase "thanks you America for the invasion and occupation of my country." The statement of `Allawi in the Rose Garden was in my opinion written for him by Bush's campaign speech writers. Even NBC Nora O'Donnel (if that is her name) noticed that `Allawi used the same language of Bush's speeches on the stump. I do not trust the Lebanese government in its recent announcement that it has uncovered a conspiracy by Al-Qa`idah in Lebanon. The government has little credibility anyway; and the same Minister of Interior of Lebanon who uncovered the plot of Al-Qa`idah announced last year with great fanfare the uncovering of a sinister plot by Satan Worshippers in Lebanon. I kid you not. There has been no evidence for the existence of Al-Qa`idah in Lebanon anyway, and the announcement by the Minister of Interior (the son of his father Michel Murr who is a client of Syria, after being a client of Israel and its candidate Bashir Gemayyel priot to that) linked the alleged plot to the Duniyyah Group which is different from Al-Qa`idah. And the leaked information about the plot were not consistent to begin with. But the Syrian and Lebanese governments are desperate for American approval (like all other Arab governments but NOT peoples) and any announcement about a plot by Al-Qa`idah gets American attention. Maybe the Maximum dear leader in North Korea will also uncover a plot by Al-Qa`idah in his own country. The US ambassador in Lebanon promptly paid a visit to the Minister of Interior to congratulate him on his efforts. America's Saudi friends: As-Safir newspaper is reporting based on the Saudi Ukaz newspaper that the Saudi local governmnet in the Ha'il region has banned a Beirut-published Arabic book because it contains texts from the Torah. 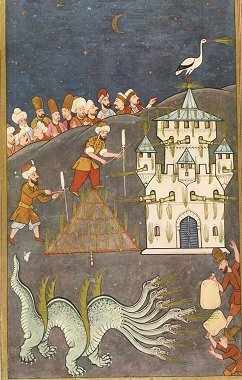 Fireworks for a Night Festival (Turkish, 1703-1730). "An Iranian woman, beaten every day by her husband, asked a court to tell him only to beat her once a week....The Tehran court found the man guilty and banned him from beating the wife, the paper said." Frustrated US forces fail to win hearts and minds: Troops hunting Taliban run into wall of silence. Why women are edging toward Bush: A growing group of 'security moms' puts national safety at the top of their list, weakening a traditionally Democratic base. Bush fails to raise Jewish support: Polls show president's support for Israel will not win votes from the traditionally Democratic mainstream who recoil from his religious zeal. Abu Mus`ab Az-Zarqawi: A thug who will stop at nothing to create pure Islamic zone in Middle East. US Warplanes Open Fire on Baghdad Slums. "Thousands of Iraqi civilians have also died as a result of conflict and its bloody aftermath - but officially, no one has any idea how many." Former CIA Agent Says Bush to Blame for 9/11. U.S. Seeks Cuts in Housing Aid to Urban Poor. Two U.S. Soldiers Charged With Murdering 3 Iraqis. Images of horror top sellers in Baghdad's 'thieves market'. No. This cannot be. U.S. Hand Seen in Afghan Election: Some candidates say the embassy pressured them not to run against puppet President Karzai. Iraq rebuilding efforts 'pitiful'. (thanks Peter). Afghanistan Battles Starvation Ahead of Polls. Widespread Torture of Iraqi Prisoners Feared as Reports Emerge of Prisoner Abuse By U.S. In Mosul. Bush again confuses IDs of two terrorists. "Now Mr. Bush hopes that by pretending that Mr. Allawi is a real leader of a real government, he can conceal the fact that he has led America into a major strategic defeat. That's a stark statement, but it's a view shared by almost all independent military and intelligence experts. Put it this way: it's hard to identify any major urban areas outside Kurdistan where the U.S. and its allies exercise effective control. Insurgents operate freely, even in the heart of Baghdad, while coalition forces, however many battles they win, rule only whatever ground they happen to stand on. And efforts to put an Iraqi face on the occupation are self-defeating: as the example of Mr. Allawi shows, any leader who is too closely associated with America becomes tainted in the eyes of the Iraqi public. Mr. Bush's insistence that he is nonetheless "pleased with the progress" in Iraq - when his own National Intelligence Estimate echoes the grim views of independent experts - would be funny if the reality weren't so grim. Unfortunately, this is no joke: to the delight of Al Qaeda, America's overstretched armed forces are gradually getting chewed up in a losing struggle." Frank Rich's excellent critique of the US media. This will be seen as a sign that Iraqi puppet prime minister/car bomber/former Saddam's assassin/embezzler-in-Yemen, Iyad `Allawi, is seeking "freedom": Allawi shakes hands with Israeli fascistic foreign minister and jokes with him. Gesture is held as a sign that "freedom" is spreading in the Middle East. The terrorist dictatorship of Libya is now welcomed into Bush's alliance of "freedom." "American military investigators have opened a criminal probe into allegations of murder and torture involving an 18-year-old Afghan army recruit who died while in U.S. custody last year. " Slaughter of yet another hostage follows a grisly pattern that is becoming routine. "About 50,000 books were irreparably damaged by the fire which swept through the top floor of the Duchess Anna Amalia library in Weimar earlier this month, twice as many as previously thought." Official Cairo "reformers" say free election is not on agenda. But appointments will be free. A glimpse of Israeli democracy. 28 Macedonian soldiers are left in Iraq; but they are defending freedom. (thanks Anthony). In 1683 Turkey was the invader. In 2004 much of Europe still sees it that way. Wealth built on slave labour. "You've Got Mail: Using E-Mail to Examine the Effect of Prejudiced Attitudes on Discrimination Against Arabs": "People who are prejudiced against Arabs may not commit assault or other overt forms of bias against them, but they will commonly discriminate against them surreptitiously." (thanks Julie). 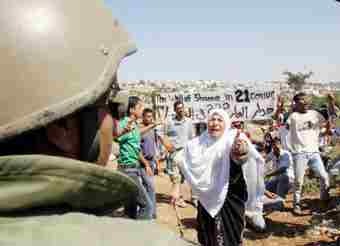 Israeli soldier jailed for abusing Palestinians at checkpoint (thousands others will be encouraged to continue their abuse). Quotation of the day: "Freedom is finding a way in Iraq and Afghanistan ..."
For those who care, I will be singing the praises of George W. Bush this afternoon at 5:00PM (Pacific Time, or 4:68 Potato Time) on Flashpoint. You may listen live. 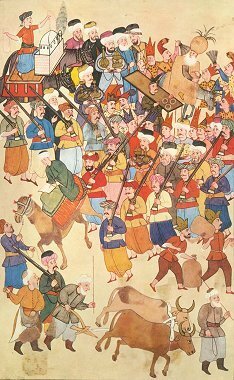 March-past of the guilds of husbandmen, millers and bakers (Turkish, 1703-1730). Microwave "liberation": Microwave gun to be used by US troops on Iraq rioters. As Income Gap Widens, Uncertainty Spreads. What is wrong with this passage (from today's New York Times): "Bush administration officials, in addition to their charge that Iran is supporting the insurgency, described new concerns that Iran is financing medical clinics, hospitals and social welfare centers in Iraq, especially in areas where the interim government of Prime Minister Ayad Allawi and American forces are not in control." Clerical sexism: Iran Moves to Roll Back Rights Won by Women. "U.N. Secretary General Kofi Annan will tell the 191-member U.N. General Assembly on Tuesday that the rule of law in the post-Sept. 11 world has been eroded both by the United States and by other nations as they battle terrorism, and by Islamic extremists and their horrific acts of violence." Help me out here. Are those Iraqis also celebrating their "liberation"?